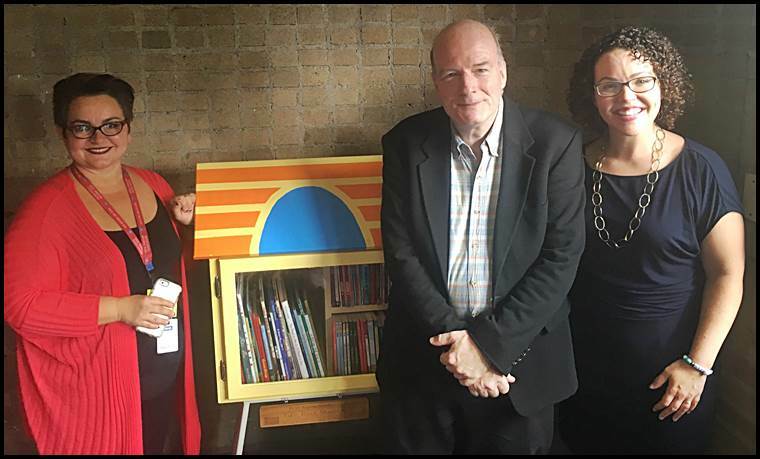 Dickinson West Elementary School teacher Suzana Bosnjakovski, Stuart Tucker and Dr. Mary-Catherine Harrison pose next to the newly installed Little Library that students will be able to access for free. Tucker, a Hamtramck resident, and Harrison helped bring about the library. Some folks recognize a need and go on about their business, but longtime Hamtramck resident Stuart Tucker saw a need and ended up making a real difference for a lot of Hamtramck children. During Reading Month last March, Tucker and others volunteered to read to students at Dickinson West Elementary school. Tucker enraptured a class of first graders, and he walked away impressed. “I was really amazed at the enthusiasm of the kids, Tucker said. For many years, Tucker has been an English composition teacher at University of Detroit-Mercy, and he came to the March reading equipped with some heady stuff, like Langston Hughes and James Joyce. “The kids asked questions like crazy,” Tucker said. Their enthusiasm became Tucker’s inspiration. He soon found himself in the position of matchmaker, when he had an impromptu conversation with a colleague at U of D-Mercy. Harrison, who directs a U of D-Mercy-sponsored literacy program called Rx for Reading became intrigued. 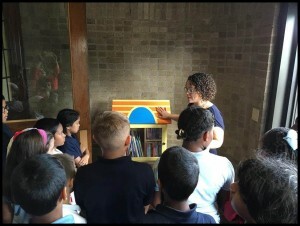 Dickinson West students are introduced to the Little Library by Dr. Mary-Catherine Harrison. Rx for Reading’s mission is to put as many high-quality children’s books as possible into the hands of kids and to support families’ reading to the kids, especially low-income families. Under Harrison’s direction, Rx for Reading has seen its slogan “One Book at a Time,” work wonders. “We have distributed almost 50,000 books since 2014,” Harrison said. But it was Tucker — the go-between — who got the ball rolling. Just doing it was a little more involved according to Harrison. She funded Dickinson West’s Little Free Library with donations made to Rx for Reading, a non-profit organization that relies solely on donations and volunteers for its Little Free Library projects, and hired a volunteer carpenter and artist. Henderson and Tucker returned to the school this fall carrying about 175 brand new books and 75 gently used books and made Bosnjakovsi’s fifth-grade class honorary stewards of the library. “I deputized them and they are charged with taking care of the library. I told them the library was theirs. Their other duties are to make sure all the other students in the school know that it’s theirs, too,” Harrison said. Through returns, exchanges, and donations, the fifth graders are also charged with keeping the Little Free Library fully stocked. Little Free Libraries is a worldwide literacy program first initiated in 2009 by Hudson, Wisconsin resident and creative artisan Todd Bol. The maker of the first few Little Free Libraries travels constantly to spread the word about book exchanges. There are now about 40,000 little libraries around the world, including two in Hamtramck. Borrowers can take a book, keep it, share it, bring it back, or replace it with another book. Schools, individuals, and community organizations keep the books flowing, mainly through donations. The Little Free Library at Dickinson West is located in the school’s entrance. Donations are encouraged to keep the books plentiful. Hopefully, Dickinson West’s Little Free Library will keep the kids reading. But, with Tucker and his reading experience as witness, there should not be any problem. Harrison said there will soon be two more Little Free Libraries in Hamtramck. One will be at People’s Community Services Center and the other will be at Corinthian Baptist Church. She’s hoping to place more Little Free Libraries in Hamtramck Schools soon – based on the interest kids at Dickinson West expressed. “The kids were amazing,” Harrison said. Harrison added that there will soon be another Little Free Library at Dickinson East, and Stuart Tucker will once again be on hand.